There could be more victims in a string of slaying of Las Vegas Valley prostitutes whose dismembered bodies were found along highways, a Las Vegas police detective said Friday. 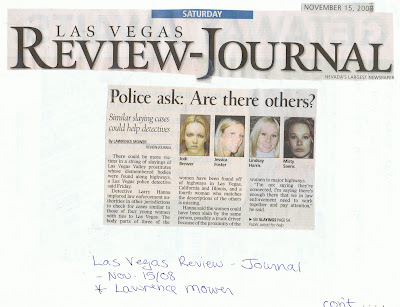 Detective Larry Hanna implored law enforcement authorities in other jurisdictions to check for cases similar to those of four young women with ties to Las Vegas. The body parts of three of the women have been found off of highways in Las Vegas, California and Illinois, and a fourth woman who matches the descriptions of the others is missing. Hanna said the women could have been slain by the same person, possibly a truck driver because of the proximity of the women to major highways. “I’m not saying they’re connected, I’m saying there’s enough there that we in law enforcement need to work together and pay attention,” he said. The discovery of other cases could produce leads into the deaths of the women, Hanna said. Investigators have ruled out as suspects the women’s boyfriends, who doubled as pimps, and have had precious few leads to pursue. No suspects have been named, and the truck driver as serial killer remains a theory. The young women, ages 19 to 25 and working as valley prostitutes, disappeared between 2003 and 2006. Fox said there isn’t anything in particular about truck drivers that would make them serial killers. They are just tougher to catch and have access to prostitutes, runaways and hitchhikers, he said. The cases of truck drivers killing prostitutes are among the most difficult to solve, he said. Police rarely have crime scenes; they have dump sites. The list of potential suspects, which would include johns, is extensive. Witnesses to the crime, which could include other prostitutes, are usually unwilling to talk to police. 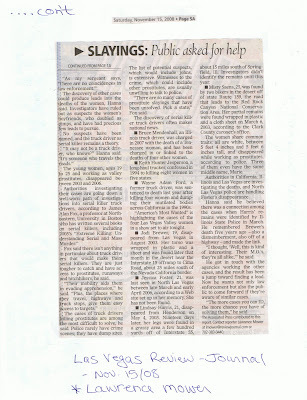 “There are so many cases of prostitute slayings that have been unsolved. Pick a state,” Fox said. The discovery of serial killer truck drivers often makes national news. - Bruce Mendenhall, an Illinois truck driver, was charged in 2007 with the death of a Tennessee woman, and has been charged in or linked to the deaths of four other women. - Keith Hunter Jesperson, a long-haul trucker, confessed in 1994 to killing eight women in five states. - Wayne Adam Ford, a former truck driver, was sentenced to death last year after killing four women and dumping their mutilated bodies across California in the 1990s. “America’s Most Wanted” is highlighting the cases of the four Las Vegas Valley women in a show set to air tonight. - Jessica Foster, 21, was last seen in North Las Vegas between late March and early April 2006, according to a Web site set up in her memory. She has not been found. - Lindsay Harris, 21, disappeared from Henderson on May 4, 2005. Nineteen days later her legs were found in a grassy area a few hundred yards off of Interstate 55, about 15 miles south of Springfield, Ill. Investigators didn’t indentify the remains until this year. - Misty Saens, 25, was found by two bikers in the desert off of state Route 159, the road that leads to the Red Rock Canyon National Conservation Area. Her partial remains were found wrapped in plastic and a cloth sheet on March 6, 2003, according to the Clark County coroner’s office. The women share common traits: all are white, between 5 feet 4 inches and 5 feet 6 inches tall, and disappeared while working as prostitutes, according to police. Three of them even have the same middle name, Marie. Authorities in California, Illinois and Las Vegas are investigating the deaths, and North Las Vegas police are handling Foster’s disappearance. Hanna said he believed there was a connection among the cases when Harris’ remains were identified by Illinois State Police in March. He remembered Brewer’s death five years ago – also a dismemberment, also off of a highway – and made the link. “I thought, ‘Well, this is kind of interesting. Their M.O.’s, they’re all alike,’” he said. He got in touch with the agencies working the other cases, and the result has been a jump toward finding a lead. Now he wants not only law enforcement but also the public to come forward if they’re aware of similar cases. “The more cases you can ID, the more chance you have of solving them,” he said. The Associated Press contributed to this report. Contact reporter Lawrence Mower at lmower@reviewjournal.com or 702-383-0440.